Human papillomavirus (HPV) is one of the most common sexually transmitted infections in the United States and has been identified as a primary cause of cervical cancer in women. Now, an international team of researchers led by the University of Missouri has completed studies on fruit flies with a condition that mimics a form of HPV-induced cancer. The fly models the team developed may help scientists understand the underlying mechanism by which this virus can cause cancer as well as identify potential drug treatments. The study appears in today’s issue of PLoS Pathogens. Previous studies conducted in human cells and in mice have shown that the virus enters the body through the skin and produces several oncoproteins, which are proteins that can transform a normal cell into a tumor cell. One of these viral oncoproteins, called E6, plays an important role during the later stages of tumor formation and metastasis. In the study, led by Mojgan Padash, a postdoctoral fellow at the University of Missouri, the researchers introduced the viral E6 oncoprotein and a human protein that is necessary for E6-induced cancer into fruit flies. The proteins caused severe abnormalities in the epithelial, or skin, cells of the fruit flies. The researchers also show reduced levels of the same suite of proteins targeted by E6 in humans. 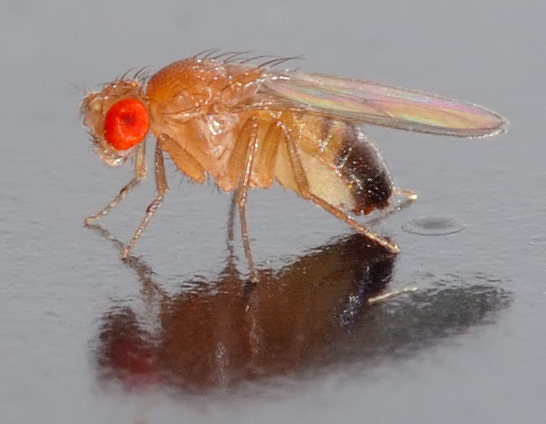 Further experiments done in human cell lines with the fruit fly version of the E6-targeted proteins yielded similar results, providing additional evidence that E6 works the same in flies as it does in humans. Although cellular abnormalities resulted, the scientists found that the E6 proteins were not sufficient enough to cause tumors in flies. Since it is thought that mutations in a human oncoprotein, called Ras, may contribute to E6-mediated tumor development in humans, the researchers introduced this third protein into the flies. With all three proteins present, the flies developed malignant tumors that metastasized. Could Oxytocin Help Treat Alcohol Use Disorder? The neuropeptide oxytocin blocks enhanced drinking in alcohol-dependent rats, according to a new study. Targeting the oxytocin system, the authors note, may provide novel pharmaceutical interventions for the treatment of alcohol-use disorder.